A labyrinth is an ancient symbol that relates to wholeness. It combines the imagery of the circle and the spiral into a meandering but purposeful path. The Labyrinth represents a journey to our own center and back again out into the world. The labyrinth has long been used for walking meditation and contemplation. The labyrinth is a good metaphor for the complexity of being alive on earth. Unpredictable turns on the path lead us in directions we can’t anticipate. Our emotions take us to places we don’t expect. Yet, labyrinths hold us safely as we walk, leading us to the center and out again. We can’t get lost, as in a maze. Simply step onto the path and follow; feel the earth come up into your feet as you move deeper and deeper into the circle. At a pace that is just right for you, you’re free to hold an intention or hold no intention or focus your breath. A labyrinth is a unicursal pattern: a well-defined pathway that winds its way to the center and back out again. Unlike a maze, there are no wrong turns or dead ends. It is not designed to confuse or bewilder. All you have to do is follow your feet. Simply place one foot in front of the other and follow the meandering path. You will reach the center and come back out again. If you do happen to cross a line, or get turned around, the worst that can happen is that you will return to where you started. Peacefully walking the Labyrinth can be a helpful spiritual tool to quiet the mind, open the heart, and bring new clarity. There is no "right" way to walk a Labyrinth. One may listen to one's breathing or repeat a prayer or mantra. One may enter the Labyrinth without expectation, or with a specific question or prayer in mind. Take a moment to clear your mind and become aware of your breath. You may want to spend some time around the outside of the Labyrinth before you begin. When you feel ready, enter the Labyrinth, find your own pace and follow the path. If you meet someone on the path coming the other way, simply turn slightly and allow each other to pass. *If you wish to pass a slow walker, or help others pass you, it is easy to do so at the turns. There are places to step off and pause if you need more time along the way. The center of the Labyrinth is a good place to pause and reflect, sitting or standing or kneeling, before retracing your steps on the path that now guides you out of the Labyrinth. A Labyrinth walk is a journey, not a race to get to a destination. You are welcome to take all the time you need. There are three movements and associated emotional states to the Labyrinth, and you are free to make of them whatever you like. Remember, there is no right or wrong way to walk a Labyrinth. These states can happen in order with the associated actions, or in a different order, or not at all. All paths and experiences are correct. On the inward journey, walkers can cast off, discard, divest, unwrap and forget. It is an opportunity to unload emotions, mental states, memories and thoughts that do not serve the walker’s highest good. At the center, walkers can pause. This space is an opportunity to be open, expectant and receptive. Walkers can take the time to listen to an inner voice, to Mystery, or to the simplicity of silence and stillness. On the outward journey, walkers can gain direction, satisfaction, comfort and new energy. It is an opportunity to integrate the knowledge gained within the Labyrinth, to prepare for leaving Sacred Space. 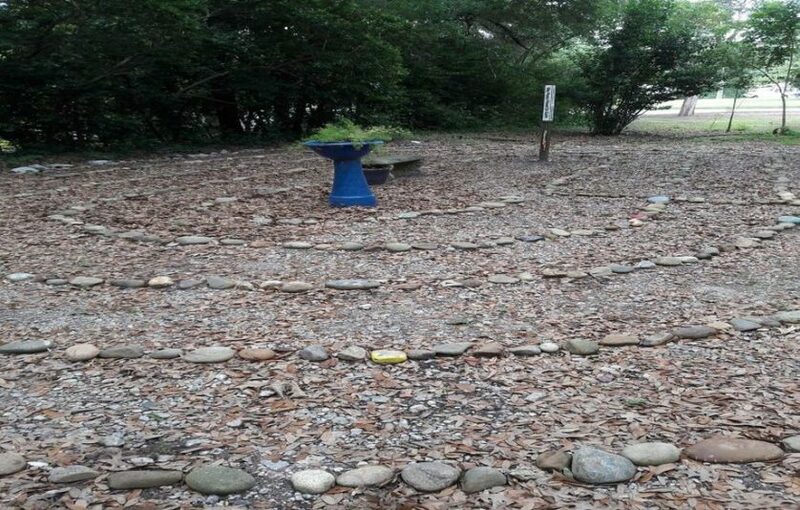 For information about UUCA labyrinth activities please contact Jan Parsons by email, info@uuaugusta.org.